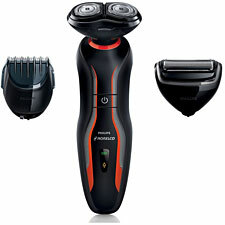 The Philips Norelco Click & Style is an all-in-one shaving and grooming tool that comes with three separate click-on, click-off attachments to easily switch from shaving, to facial styling, to body grooming, quickly getting back to focusing on more important things, like playing video games. Philips Norelco has also created the first-ever “Nail Your Game Playbook,” a guide on how to do life without leaving the couch. As they’ve launched the most versatile shaving tool to lifehack the grooming game, they now want to show guys how to lifehack their gaming game. Click here to check out the Playbook GIFs and videos. The tool in question has three facets, just like your mom: shave, style and groom. Dual Rotary Razor: This is what you shave above the neck with. En Espanol, el accesorio rasurador de doble rotacion esta disenado para un rasurado limpio y squave sin raspaduras ni cortes. Muy bueno, indeed. Perfect Stubble Beard Styler: This attachment will get you that Aaron Rodgers look, or if you’re a beardsman, that clean yet robust Dan Fouts face-scarf. Body Grooming: Not to be confused with the Beastie Boys’ classic “Body Movin,'” this attachment is for all areas, ahem, below the neck, if you smell me. The Click & Style was designed for maximum quickness and efficiency so guys can focus on things that are really important. For you to #NailYourGame, you need to be completely unencumbered.